The United Nations is calling on world leaders to take action on the environment following the release of a sweeping report that suggests climate change is happening -- and it could have dire effects on future generations. The UN’s Intergovernmental Panel on Climate Change presented in Denmark on Sunday is the final volume of a comprehensive climate assessment, which said climate change is almost entirely influenced by human activity. If left unchecked, the panel warned that climate change will increase the likelihood of severe and irreversible impacts on the human population and the ecosystem. Diverting course from the effects of climate change may require eradicating greenhouse gas emissions by 2100, the report also said. “The good news is, if we act now, immediately and decisively, we have the means to build a better and more sustainable world,” UN Secretary-General Ban Ki-moon said. Such changes would include ending a global reliance on oil, gas and coal -- the leading sources of greenhouse gas pollution. The UN report says it would cost less than 1 per cent of the world’s annual budget to shift to clean energy resources. The world is already seeing the impact of global warming, the report said, in the form of droughts, flooding and severe weather. In a statement on Sunday, the David Suzuki Foundation said Canada “must respond quickly to ensure that clean energy becomes a national priority” in order to avoid the risks of climate change. “This final report by leading scientists and economists shows that the severity of climate change impacts and extreme weather is not a matter of chance,” said Ian Bruce, the foundation’s science and policy manager. In an October report, the Auditor General of Canada found that our country’s plan to shrink carbon pollution has been “ineffective” and poorly co-ordinated. 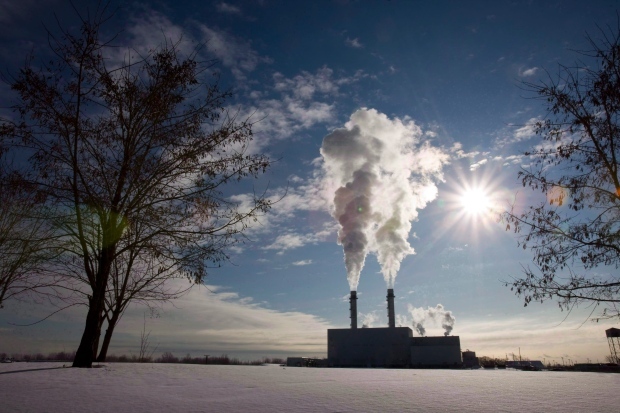 The report outlined concern that Canada would not meet its 2020 emission reduction target, and said that the government is lagging in creating a plan to find greater reductions beyond that deadline. The Canadian government has also been criticized for not meeting its 2007 commitments to regulate the oil and gas industry. In September, Prime Minister Stephen Harper was slammed for not attending the UN Climate Summit in New York City. John Bennett, Sierra Club Canada’s executive director, said Sunday that he’s discouraged by the lack of investment in renewable energy by the federal government. The risk of doing nothing, he says, far outweighs the cost of moving to renewable energy. “We have to phase out fossil fuels over these next 100 years or we’re going to pass on a world to our grandchildren that has areas that are uninhabitable that were once very good for people to live,” Bennett told CTV’s News Channel. Following the release of the report on Sunday, Canadian Environment Minister Leona Aglukkaq’s office issued a statement saying the Conservative government has decreased emissions while growing the economy. Blair Feltmate, of the University of Waterloo Climate Change Adaptation Project, said that the UN report emphasized that “time is not limitless” in terms of fighting against climate change. “I think there could have been a little more emphasis in reference to in the immediate term, what do we do to adapt to the extreme weather that we’re currently experiencing,” Feltmate said, also pointing to measures Canada can take to mitigate flooding risks.